Whenever I see something advertised as having 20 uses, I assume that at least 19 of them are a terrible idea or a serious stretch. It's pretty hard to design something that really and truly works well in multiple circumstances. So when I saw the Kurumi Ket Carrier Cover with Hoodie advertised as having "5 in 1 uses," I was extremely skeptical. I was originally looking for a cover to use with a carrier while preparing for the arrival of our son. This is because when my daughter was a baby, we just tried to carry her inside our coat (see picture on the right). 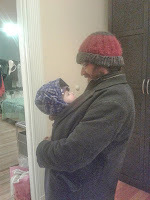 This really didn't work well and resulted in neither my daughter nor the parent carrying her being particularly warm. So, I saw that the Kurumi Ket Carrier Cover with Hoodie had good reviews and figured that worst case, we would only use it as a carrier cover and nothing else. Color me wrong. So far we have tried this extremely versatile blanket in a number of circumstances with great success. I don't always use a nursing cover for modesty reasons, especially when there is literally no one else around. I have, however, started to have the experience of needing to nurse outside in less than pleasant weather. When I only had one child, I would, of course, go somewhere more comfortable in these circumstances. However, my older kiddo really does need to be able to run around and the younger kiddo isn't exactly patient when it comes to food. Thus, I have been finding myself nursing on a park bench in all kinds of weather recently. The Kurumi Ket really does work great as a cold weather nursing cover. The fleece hood keeps it on the baby without much need to even close the snaps (though I could if I needed to) and I can still see what I'm doing. Viola - baby and mom are warm. 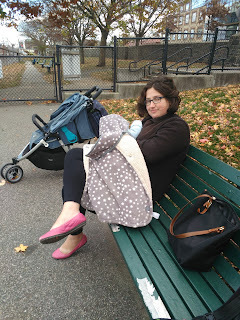 We never ended up getting one of those foot muffs for the stroller when my daughter was a baby (the Skip Hop Stroll and Go Three-Season Footmuff is a well regarded example). We pretty much just put her in a warm coat and headed out. If it was particularly cold we'd throw a blanket on her and if it was windy we'd use our rain cover. However, for those days when the weather was changing and we ended up relying on the blanket more than planned, it was always a pain to keep it on her and in the stroller. More often than not, the blanket would fall out at some point during the outing only to be rolled and then stepped on by yours truly. This is why I totally love the idea of using the Kurumi Ket as a stroller blanket. The little arms with snaps can attach to the stroller frame so there is no way of losing it. They recommend attaching it "upside down" with the hood covering the baby's feet - genius! It's certainly not as warm as a real footmuff but so far it's been working great. Last, but not least, we are also using it as a carrier cover - the item of desire that started this whole thing in the first place. Here I am, pictured about to embark on a walk with my little bear snuggled comfortably in his carrier, covered by the blanket. All around I would give this blanket an enthusiastic thumbs up! Not only is it truly versatile but for the price it is honestly great value. I think it's about to join the Mai Tai as a permanent resident of my stroller basket.